The inscription referring to the Tosa School is most probably that of Kanō Yasunobu (1613-1685) but has not been verified. Familiar names: Genshirō, Shirojirō, Ukyōnoshin. Gō (art names): Bokushinsai, Eishin, Ryōfusai, Seikanshi. Yasunobu was the son of Kanō Takanobu (1571-1618), who died when Yasunobu was a child. He studied in Kyoto under Kanō Kōi (d.1671) and his elder brother Tan’yū (1602-1674). Tan’yū later moved to Edo to found the Kajibashi branch of the Kanō family and was joined by Yasunobu who then became goyō eshi (official painter) to the shogun’s court, founding the Makabashi Kanō School. Yasunobu was later adopted by Kanō Sadanobu (dates unknown) as his heir and was therefore regarded as the eighth-generation head of the main Kyoto Kanō line. 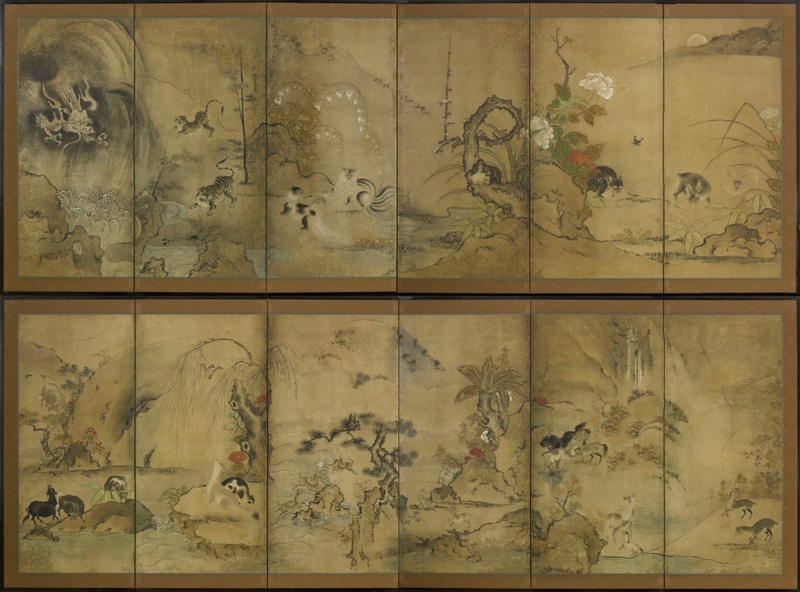 A connoisseur of paintings, Yasunobu signed many certificates of authentication for Kanō paintings and later in his career was awarded the honorary title of hōgen (lit. Eye of the Law). One of his greatest accomplishments was painting the walls of the Shishinden Seiken of the Imperial Palace, Kyoto. Tsuru (cranes) are among the premier symbols of longevity and good fortune in East Asia. For at least two millennia, the Chinese have viewed them as living to a great age and as being able to navigate between heaven and earth. In turn, these attributes have made them logical companions of sennin, the Taoist Immortals. Ancient Taoist alchemists believed that imbibing beverages made with crane eggs or tortoise shells would increase one’s vital energies. 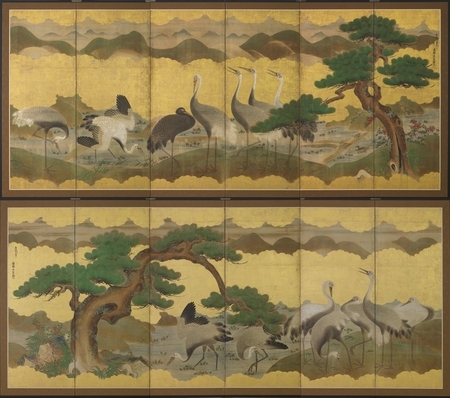 In Japan, the crane is the animal most frequently seen in the fine and applied arts. Although a common subject of painting, it is most closely associated with the New Year and with marriage ceremonies. In earlier times, when the Japanese still used circular brass mirrors and presented them on the occasion of a marriage, the crane was a favoured decorative theme due to its association with fidelity. In recent centuries, the crane has appeared on elaborately embroidered wedding kimono and among the mizuhiki (cord made from twisted paper) decorations presented at the time of betrothal. The minogame (terrapin) of a thousand years, often paired with the crane as a symbol of longevity, is one of the four supernatural animals (tiger, dragon, phoenix, terrapin) of Chinese mythology. One representation of the terrapin has some of the features of the dragon, generally the head, but the most common is of the sacred animal with a long tail, said to grow when it is over five hundred years old, the origin of which is probably due to the fact that tortoises kept in ponds become covered with a parasitic growth of vegetable origin which resembled the Mino, or rain coat of the peasants, hence Minogame. n.b There are repairs along some of the hinge areas. There are also small areas of repair throughout the screen commensurate with age. SKU: 7339/40. Categories: Screens, Six Fold.